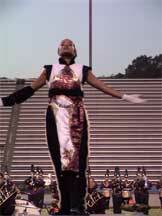 Mandarins drum major Jillene Sturgess acknowledges the Glendora crowd. Almost 3,000 fans in Glendora, Calif., enjoyed both perfect weather and terrific drum corps action Saturday evening, as two brand-new Division I California corps, Pacific Crest (69.80) and the Mandarins (69.75), strutted their stuff and turned in inspired performances. The Phantom Regiment (81.00) came out on top, just edging out the Santa Clara Vanguard (79.55). Jonathan Kisner, a Pacific Crest percussion tech, said that his corps had turned in an optimal performance in Glendora. "Tonight was by far the best performance of the year, lot of energy, it seems like the kids went for it tonight. The past few days of rehearsal has been really intense, hot, the kids worked really hard, trying to take to the next level," Kisner said. This is Pacific Crest's 10th marching anniversary, and the corps is enjoying its first season as a Division I corps. Kisner added that the group is really anticipating an Orlando finals appearance. "Everybody is really excited about going to finals for the first time, the ten-year anniversary, and it just seems like this group really wants to go for it this year," Kisner said. The Mandarins, meanwhile, after a "not as productive" show in Riverside, according to drum major Jillene Sturgess, turned in a decent performance. "We came down here in southern California last Wednesday and ever since, we worked our butts off, and all our efforts and practice paid off for tonight's show. We had a show two day ago in Riverside, Calif., and it was not as productive, it didn't show as much. But tonight's performance was definitely better," Sturgess said. Sturgess, 21, is in her ninth year as a Mandarins member, and is from Davis, Calif. Phantom Regiment (81.00) came out ahead. "I had an incredible performance, it was definitely a special one," said Steve Parker, the 21-year-old Regiment euphonium section leader from Vancouver, Wash. "I haven't had a performance like this, which such a level of energy, at least since semifinals last year, it was really special," Parker said. According to members of the Santa Clara Vanguard (79.55), that corps' performances are evolving and improving as the season progresses. "I think the show tonight was really good," said Kelly Durcholz, a 20-year-old Vanguard pit member from Jasper, Ind. "It is definitely getting better and better everyday, I really think that all the sections are finally coming together. There was not as much excitement as the previous show, but personally I did well, considering the fact that we always can be better," Durcholz said. In Division II action, Esperanza (76.25) lead the pack, despite turning in a "safe" performance, according to percussion caption head Mathew Arnstreny. "Tonight's show was sort of a dead show actually. We had a little rush tonight getting here with the traffic so I think it did affect their performance tonight, making them play on the safe side. We were a little tight getting here, so we had a brief warm-up, which I think affected tonight negatively. But all the new stuff hung together. Stuff that is new this weekend was in place tonight." Impulse (68.00) came out in second in that division. "It was probably one of our best performances," said Impulse percussion tech Ernie McLaurin. San Diego Alliance (58.60) was victorious in Division III competition in Glendora. Assistant director Stephen Opgenorth said, "I am really proud of what our members did out there tonight. I think the best part of the show was when the battery puts the boxes on, that brings us to a very cool groove section."